NEW YORK (CNNMoney) -- Americans tempted by the promise of fast cash are paying an average of $520 a year in fees for short-term credit lines known as payday loans. An estimated 12 million Americans take out payday loans each year, according to the Pew Charitable Trusts' Safe Small-Dollar Loans Research Project. On average, these borrowers take out eight loans per year, averaging $375 each, the survey based on focus groups and telephone interviews found. Over the course of two weeks -- when payday loans typically come due -- fees averaged $15 per $100 borrowed, amounting to a 391% annual percentage rate. Most lenders display costs as fees, but they can also be reflected as interest rates. Because of the small-dollar amounts extended and the relatively easy access -- no credit check is required -- payday loans are often marketed as "fast cash" to cover emergency expenses that arise before a borrower's next paycheck arrives, which is typically two weeks, Pew said. But Pew's study reveals that most borrowers actually use payday loans for regular living expenses -- not for emergencies, as many payday lenders advertise. Plus, the average borrower takes out eight loans and is indebted about five months of the year because they continue to renew the original loan. "[M]illions have turned to payday lenders when finances are tight, finding fast relief but struggling for months to repay loans," according to the study. Lenders typically require access to a borrower's bank account so that they can verify that the borrower has a source of income, and can then automatically withdraw the amount owed when the customer's next paycheck is deposited into the account. After renewing a loan of $375 eight times, for example, the average borrower would pay back a grand total of $895 -- including the $375 principal and the average $520 in fees or interest, according to Pew. Who uses payday loans? More than half, or 55%, of payday loan borrowers are white, and 52% are female, in line with the general demographics of the country, Pew found. But the demographic groups that are most likely to take out a payday loan include African-Americans, people earning less than $40,000 per year, divorcees, and people without four-year college degrees. African-Americans are 105% more likely than other races or ethnic groups to take out a payday loan, for example. 0:00 /1:28What is the CFPB? "If you look at the country as a whole, most people are white and female, so our results reflect those demographics, but if you take white people as a group and compare them to black people, you see that the average African-American is more likely to use payday loans compared with the average white person," said Pew project director Nick Bourke. About three-quarters of borrowers get payday loans from storefront lenders -- which can include big banks or smaller companies -- while a quarter of borrowers go online to borrow. Online loans are typically more expensive -- coming with average fees of $95 per $375 loan, compared to $55 fees for storefront loans, the study found. Most payday loan borrowers, or 69%, use these loans to pay for a recurring expense, like rent, a mortgage, utilities, credit card payments or food. Meanwhile, only 16% use the money to cover unexpected costs like medical expenses. While payday lending proponents argue that the loans are "a vital way to help underserved people solve temporary cash-flow problems," Pew said that most borrowers -- or 81% -- said they would cut back on expenses like clothing and food if they didn't have enough money and were unable to take out a payday loan. As a result, Pew found that state regulations that restrict payday lending -- by capping interest rates or fees or limiting the number of loans a borrower can take out -- reduce the number of people taking out payday loans and do not drive borrowers to seek out more expensive alternatives. In states where payday lending is heavily restricted, for example, 95% of "would-be borrowers" said they wouldn't use an online payday lender if they were unable to get a loan from a storefront lender. 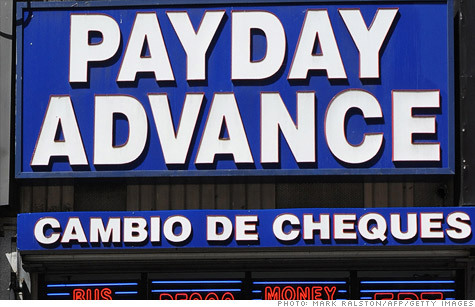 The Consumer Financial Protection Bureau was given the authority to regulate payday lenders at the federal level. The agency's director, Richard Cordray, said earlier this year that examining the practices of payday lenders is a top priority, and the CFPB will be gathering information and conducting on-site audits about the business practices of these lenders. He also said the agency is aware of some major banks offering payday-like loans, which consumer groups say can trap borrowers in similar cycles of debt.